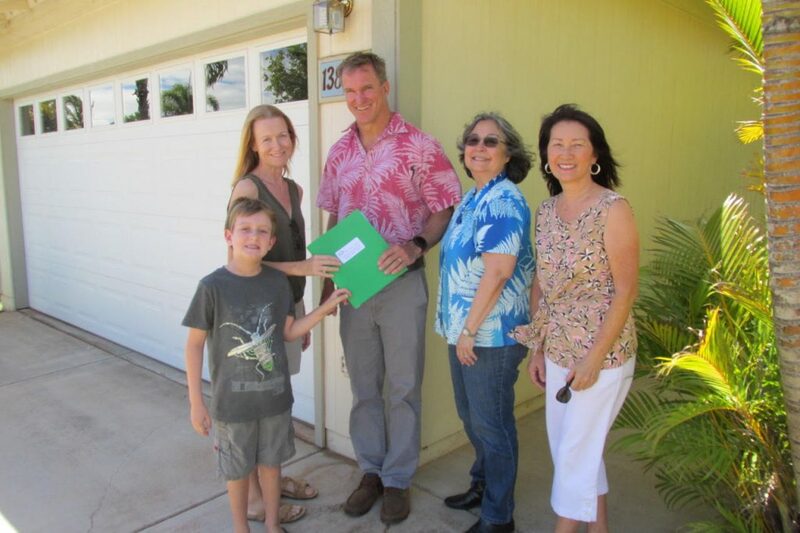 Carolyn DeMott (standing left) and her son River are handed the keys and a welcome packet for her permanently affordable Nā Hale O Maui home in Kīhei. With her from left to right are Nā Hale O Maui’s Dave Ward, President, Cassandra Abdul, Executive Director and Natalie Fitzgerald, Housing Coordinator. Nā Hale O Maui celebrated the sale of its 34th permanently affordable home. 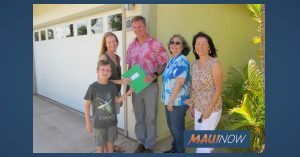 This marks the second sale of the home in Kīhei, which was repurchased by NHOM from the first homeowner, who received a portion of the shared appreciation, while keeping the home affordable for the new homeowner. Carolyn DeMott struggled for years to find an affordable home for herself and her 7-year old son, River. “Nā Hale O Maui is people in the community helping people in the community be able to have a home and a place to feel proud and have some roots and have a future. And as a teacher I know it is something most of my colleagues can have. I am a teacher and I have been teaching on Maui for 12 years, mostly science and math,” said DeMott. For more information on Nā Hale O Maui visit their website at Nahaleomaui.org .